As a new parent there are many daunting things to learn. From giving baby a bath to how to feed them and get them to sleep, there is always something new to discover. Of course another normal part of human development is growth. And not just in height - growth also applies to hair and nails as well. Baby's that go overdue are often prone to being born with long nails which need cutting as soon as possible to avoid scratching their own faces. Of course baby's have everything in miniature - including their nails. This means that you need to take extra care when cutting baby's nails to avoid injury. Babies are wigglers and usually aren't very fond of having their hands or bodies held still, so cutting their nails can often be more difficult than it sounds. As baby grows older their wiggles also become more pronounced, often making nail cutting a difficult and painful chore for everyone. Here are some tips to help you trim your baby's nails with the least hassle possible! Hold hand, holding the finger of the nail you want to cut between your own fingers. Trim nails gently with baby nail scissors. Make sure that you trim straight across for best nail regrowth, not in an oval shape. Fingers - the nail can simply peel off because they are so soft. Teeth - some mothers use their teeth to easily cut the child's nail. Cut nails while baby is in the bath so they're more relaxed and less likely to squirm. The best way to trim a young baby's nails is with a pair of blunt ended small scissors. You can buy special baby scissors. 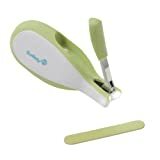 Small curved end scissors are also great for baby's nails because the curve allows you to cut evenly and away from baby's fingers. 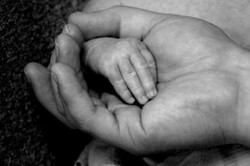 Once a baby reaches six months of age, their fingers and nails are usually larger, allowing easier access. However by this age they've become very good at wiggling! Some babies love having their hands and feet attended to while others just hate to lie still and want it over as fast as possible. When my older son was a tiny baby my partner drew blood clipping his nails. It terrified both of them and I've been on nail cutting duty ever since! When my girls were that age, especially the first one, I was terrified that I would cut them when I needed to trim their nails. Good tips. It is so hard to learn all that stuff as a new mom or dad. Great instructions.